Aten was a being who represented the god or spirit of the sun, and the actual solar disk. He was depicted as a disk with rays reaching to the earth. 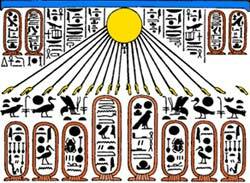 At the end of the rays were human hands which often extended the ankh to the pharaoh. Aten's origins are unclear and he may have been a provincial Sun-god worshipped in one of the small villages near Heliopolis. Aten was called the creator of man and the nurturing spirit of the world. In the Book of the Dead, Aten is called on by the deceased, "Hail, Aten, thou lord of beams of light, when thou shinest, all faces live." It is impossible to discuss Aten without mentioned his biggest promoter, the pharaoh Amenhotep IV, or Akhenaten. Early in his reign, Akhenaten worshipped both Amon (the chief god in Thebes at the time) and Aten. The first as part of his public duties, the latter in private. When he restored and enlarged the temple of Aten first built by his father Amenhotep III, relations between him and priests of Amon became strained. The priests were a major power in Egypt and if another god became supreme they would lose their own prestige. Eventually, relations became so strained that Akhenaten decided to built his own capital by the Nile, which he called, "Akhetaten", the Horizon of the Aten. At Akhetaten, Akhenaten formed a new state religion, focusing on the worship of the Aten. It stated that Aten was the supreme god and their were no others, save for Akhenaten himself. It has been said that Akhenaten formed the first monotheistic religion around Aten. However, this is not the case. Akhenaten himself was considered to be a creator god and like Aten was born again every day. Aten was only accessible to the people through Akhenaten because Akhenaten was both man and part of the cosmos. Akhenaten systematically began a campaign to erase all traces of the old gods, especially Amon. He erased the name of Amon from the temples and public works. He even went so far as to erase his own father's cartouche because the word "Amon" was featured in it. Even the word "gods" was unacceptable because it implied there were other deities besides Aten. It is clear that the Egyptian people never accepted their king's religion and view of the world. Even at his own capital, Akhetaten, amulets featuring Bes and Tauret have been found. Following Akhenaten's death, Atenism died rapidly. Mostly because the people never really believed in it and also because Akhenaten's successors did all they could to erase Akhenaten and Aten from the public eye. Eventually, Akhetaten became abandoned and the name "Akhenaten" conjured the dim memory of a "heretic king."